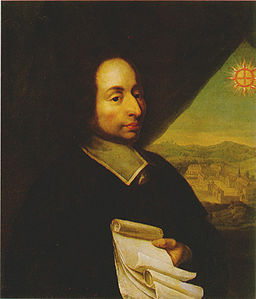 Blaise Pascal was born in Clermont-Ferrand in the Auvergne region of France. Following the death of his mother in 1631, he moved with his family to Paris. Taught by his father, Étienne Pascal, a civil servant and an active and influential member of Marin Mersenne‘s scientific circle, Blaise emerged as one of the most talented mathematicians, natural scientists, and philosophers of his age. As a teenager, having conducted already significant work in geometry, the young prodigy was introduced to Mersenne’s circle. In these early years, Pascal focused on and extended Girard Desargues‘s work on conic sections. It was the treatise published in February 1640, Essai pour les coniques, resulting from this work that first attracted attention from René Descartes and led to the beginning of a complicated, and unfortunately often negative, relationship between the two philosophers that was to last until the latter’s death in 1650. From 1646, Pascal conducted significant work on pressure and he attempted to replicate Evangelista Torricelli‘s experiments with barometers. His conclusions, that a vacuum is left when the tube filled with mercury is inverted, were at odds with those of Descartes and this, in particular, fuelled the tension between the two men. In response to his father’s perilous financial position, Pascal constructed a reckoning machine capable of both addition and subtraction (it was able also to carry out multiplication and division calculations, albeit with some difficulty) and he continued to make improvements to the design of this calculator throughout his twenties. His work as a mathematician on what is called ‘Pascal’s triangle’ and on the beginnings of the theory of probability — which evolved as a result of his correspondence with Pierre de Fermat — proved a focus until 1654. In the November of this year, however, Pascal underwent a spiritual experience and shortly afterwards, in January 1655, he began work on Lettres provinciales. Published between 1656 and 1657 these letters were written under the pseudonym Louis de Montalte. Pascal suffered throughout his life from chronic poor health and his most influential work, published ultimately as Pensées, was not complete by his death in 1662. The calendar of Pascal’s correspondence is based on the volume edited by Maurice Beaufreton and published in 1922. It is hoped that the metadata for further letters will be added as these are brought to our attention. Cultures of Knowledge would like to thank EMLO Digital Fellow Charlotte Marique for her work to collate the metadata, and Dr Philip Beeley for his unfailingly considered and scholarly advice at every stage. Les lettres de Blaise Pascal: accompagnées de lettres de ses correspondants, ed. Maurice Beaufreton (Paris: G. Crès, 1922). At present this calendar covers forty-nine letters dating between 1643, when Pascal was just nineteen, and 1661, the year before his death. Amongst his correspondents are Pierre de Carcavi, René Descartes, Pierre de Fermat, Christiaan Huygens, Marin Mersenne, Christopher Wren, and Pascal’s own family, including his father Étienne and one of his sisters, Gilberte. For an English translation of Lettres provinciales, see Blaise Pascal, Provincial Letters, tr. Thomas M’Crie (University of Adelaide, accessed 15 August 2016).